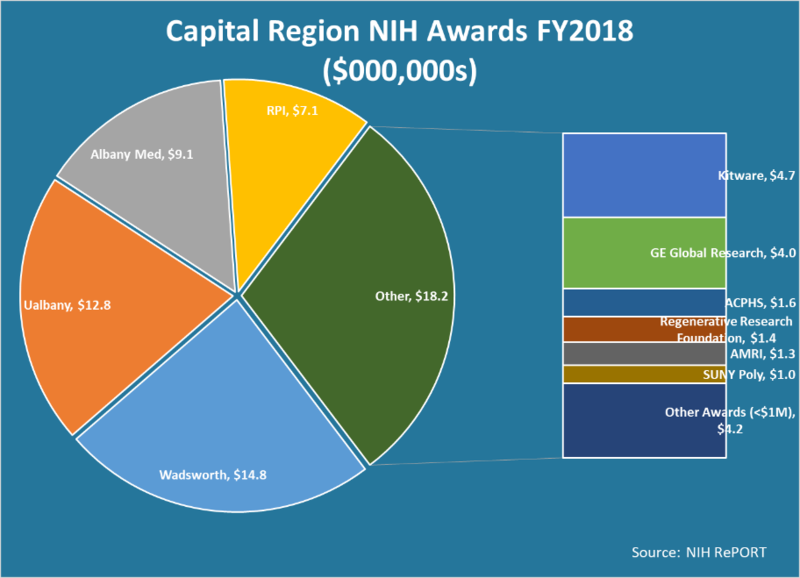 The Capital Region’s biotech sector saw a 13.5 percent year-over-year increase in National Institutes of Health (NIH) awards in fiscal 2018. Between 20 firms and institutions, the region received 154 awards totaling $62 million. That was the eight-county region’s largest amount of NIH since fiscal 2013, according to a Center for Economic Growth (CEG) analysis of data from the NIH Research Portfolio Online Reporting Tools (RePORT). The Capital Region awardee with the biggest annual increase of NIH funds (by value) was the University at Albany, which received $12.8 million. That was up $5.4 million from the previous year and the university’s largest NIH award total since fiscal 2004, when it received an inflation-adjusted (2018 dollars) $13.5 million. Other awardees with big year-over-year funding gains were GE Global Research in Niskayuna (up $2.8 million to $4 million), the New York State Department of Health’s Wadsworth Center (up $2 million to $14.8 million) and the Albany College of Pharmacy and Health Sciences (up $1.3 million to $9.1 million). More than half of the region’s federal life sciences R&D funds came from four NIH institutes and centers (ICs): National Institute of General Medical Sciences (NIGMS), National Institute of Allergy and Infectious Diseases (NIAID), National Institute of Biomedical Imaging and Bioengineering (NIBIB) and National Cancer Institute (NCI). The $35 million awarded by these four ICs in fiscal 2018 was 29.2 percent more than their total for the previous year. Marketing the Capital Region’s life sciences R&D assets at talent pipeline at events such as the New York BIO Annual Conference and MD&M East in New York, the BIO International Convention in Boston, and The MedTech Conference in Philadelphia. Conducting a 2017 life sciences cluster study that developed an action plan for: 1. improving the commercialization of local life sciences innovations, 2. strengthening the region’s life sciences ecosystem; 3. and recruiting contract research organizations (CROs) to the region. Assisting life sciences startups with accessing labs, office space, and other facilities; developing venture pitches; identifying potential investors and mentors. Helping biotech firms, such as Vital Vio, grow through a suite of Business Growth Solutions, such as continuous improvement, technology acceleration, energy and sustainability, supply chain development and workforce initiatives.